Want to come Sailing, Canoeing, Kayaking or Rowing? OK How do I get on the water? There are different ways we can enable individuals to go on the water, please look through the following options. Please be aware that sailing, canoeing and rowing are weather dependent and we reserve the right to cancel at any time if we consider the conditions are unsuitable. These sessions are open to anyone with any form of disability or additional support need, as well as their friends, family and carers. We find the activities are particularly enjoyable if you come along with a friend or two! Sessions are £6 per participant (concessions available), carers go free, anyone else – feel free to make a donation! For those who want to sail, but are nervous of sailing on their own, we can offer an instructor or experienced sailor to accompany them. We use the access dinghies (left of picture) for independent sailing and have dinghies which are fitted with electric hand controls for those who have little strength or mobility in their upper limbs. 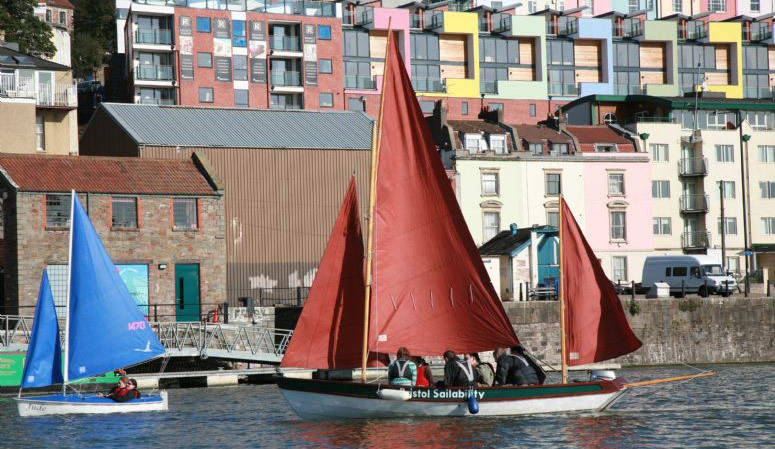 If you want to sail as part of a group we also have the drascombe lugger (right of picture), which is a traditional wooden sailing boat and gives an opportunity to sail up the harbour past the SS Great Britain. The pioneer safety boats are on hand, but our accessible powerboats will be used to take people on trips around the harbour. Our powerboats are wheelchair accessible so there is no necessity to transfer from your wheelchair. There may only be 1 trip per session, so please arrive by 10.15 am to ensure your space on the boat. Canoeing and/or Kayaking will be available when we have volunteer support, for those of you that wish to try some paddlesports! We have open Canadian Canoes, Sit-on-top kayaks, sit inside kayaks (two with stabilisers), KataKanus and a Bell Boat available for use. The Bellboat can take up to 10 people so if you have friends who want to come down and use it let us know! Please download the Sailability Registration form and bring it with you for the first time, so that we know if there are any specific requirements or concerns you might have. Please be aware that if there are large numbers attending this may shorten the amount of time you are able to sail as we will give everyone time on the water. These sessions are on Tuesday evenings during term time from 4.00pm to 6.00pm from Easter to October. It is for any junior sailor who wishes to sail in a more supported environment. This session is very suitable for young sailors who are on the Autistic Spectrum or have Learning Difficulties, as the session is run by experienced volunteers and the session is calmer than the Saturday session. Typically, this session involves with the youths sailing or having a powerboat trip up the river. The Sailing boats are accessible. We have an array of boats which means the youth can learn to sail a boat as a group or on their own. We have hoists to support them in and out of the boat if needed. Our wheelchair accessible powerboats will accompany the sailors up them river. Please download the Participants Details – Sailability form and send it in to us or bring it with you on your first session. The session costs just £6 (carer’s go free). There is no need to book, just turn up. We meet by the flag pole beside our centre, near the waterside steps. We firmly believe that the most fun can be had sailing with your own age group and making new friends. With this in mind we will try to provide our disabled young sailors or canoeists the opportunity to sail or canoe in one of the after school clubs with additional support from volunteers. Please contact us to discuss.